We will create your gift certificate when we receive your payment and will email it to the email address listed on the form. Note: After filling out certificate details, click SUBMIT, then go to payment area below. Reviews are from our Yelp Page. 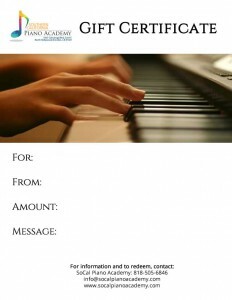 To provide the highest quality and affordable piano and music education to all members of our Los Angeles communities.